Some of you have been lucky enough to meet our friend and colleague Frank Poot over the years. 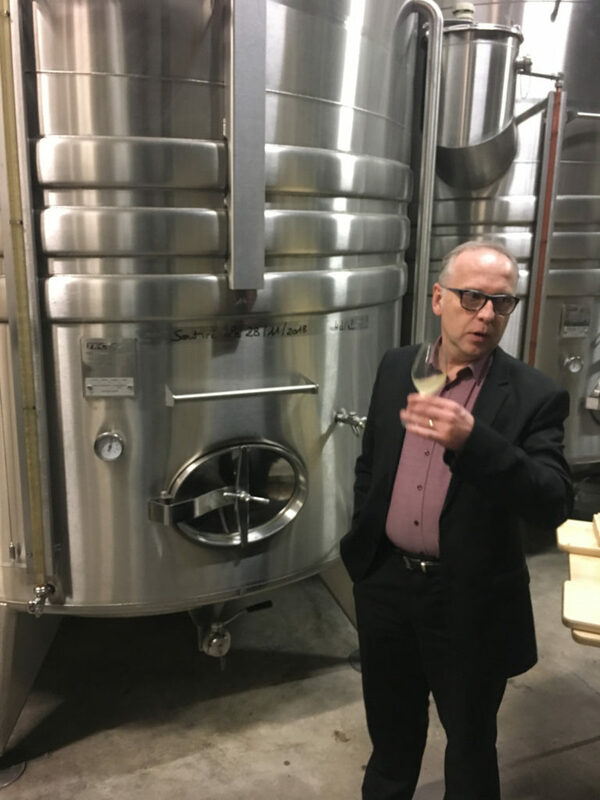 Now 68 years young, Frank started his long and storied wine career in a somewhat atypical way, working as a young commercial truck driver transporting tulips from his native Holland to all corners of France. Frank never considered a day complete without settling into whatever was the typical cuisine of the region he found himself in, and he invariably accompanied this food with a few glasses of regional wine. 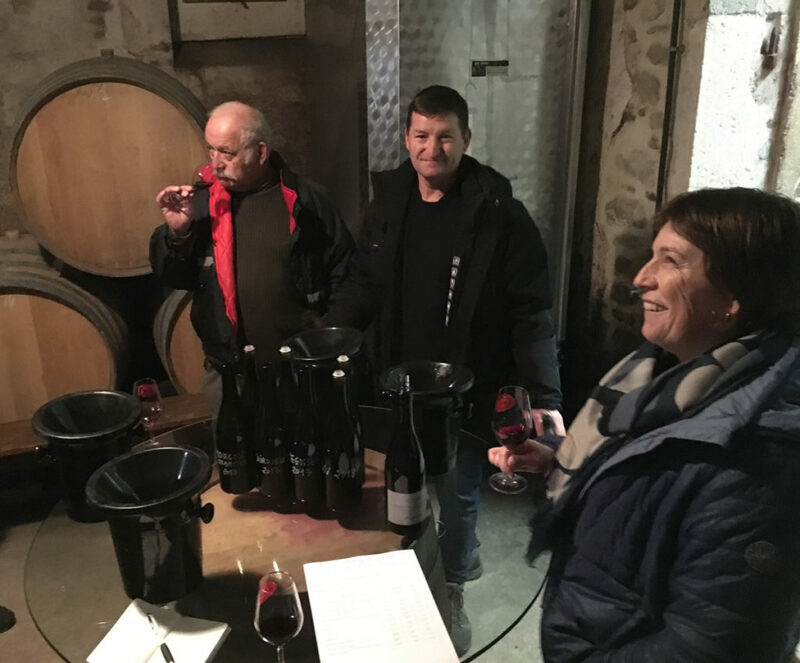 Frank soon started taking his tulip truck on detours to stock up on wines he particularly enjoyed, and Frank’s contagious personality meant that he soon had forged friendships with winegrowers across France. This activity quickly turned into selling wine to friends, which turned into Frank co-founding the Bordeaux negociant Vintex in the mid-1980’s (an iconic firm still thriving to this day and our top supplier in the region). Frank’s efforts at Vintex led him and our late Founder Mike Temple to meet. In time Frank sold his shares in Vintex, created Poot Agenturen (now one of Europe’s leading wine distributors), and he and Mike went on to share their travels, producer portfolios, and vacations over what was a pretty incredible thirty year friendship. After Mike Temple’s untimely passing in 2015, Frank stepped in to formally become Grape Expectations’ eyes and ears in Europe. Frank’s radar for talent, culture, and value is second to none. Every morning I feel blessed that we have this opportunity to work with him. Without further ado, below are Frank’s trip notes from what was a fast and furious junket! Interesting experience tonight. I’m on my way to Fèvre et Fèvre and since they could only see me tomorrow morning I decided to leave early and spend the night in the area. It so happened that Chablis was booked solid and I ended up in a small, rural village, called Ligny-le Châtel at the very North end of viticultural Chablis. The establishment, Le Relais Saint Vincent (relais usually indicates a place where coaches changed horses and passengers ate and drank. As it is along the old road from Troyes to Auxerre it seems to fit), is pretty old, but clean and comfortable. It is run by a guy who got tired of his well paid job at the RATP ( Parisian public transportation system) and decided in 2008 to do something else. He ended up with an old hotel-restaurant in the boonies (how deep can a man fall…). The restaurant is actually pretty good with some of my old favorites like Jambon Persillé and Andouillette de Chablis. The wines were remarkable (I’m getting there). They had a straight Chablis 2016 by the glass from Yvon Vocoret, a local grower and probably related to the Vocorets in Chablis (big time producers). Easy style, but very dry and typical. For red I had Irancy 2015 from Richoux which they served by the glass at € 5,50 or a half bottle at € 22 ( which I had). Astonishing wine, dark, young, tight, full-bodied and more spice than I have ever seen in a PN. Above all, very earthy. For cheese I had Chaource and Soumaintrain ( ëpoisses like}, both local and showing very well (Isn’t September such great time of the year for cheese?!?). The combination of the cheeses with the Irancy was astonishing, both the cheese and the wine have very earthy characters and seem to be made to go together. So, are we then talking about terroir or earthiness, or both??? Nathalie and Gilles Fevre have some 120 acres total, mostly in Chablis and Fourchaume. State-of-the-art winery. Owned and run by Gilles and Nathalie along with daughter Julie. Nathalie is the winemaker (she was La Chablisienne’s winemaker for twelve years). Availability is very good, they still sell grapes/must to a handful of top echelon names, whom we will keep un-named! Harvest 2018 just finished – It started early on Sept. 3 and ended Sept. 27. Winter and spring were quite wet, perfect water table. Growing conditions were just perfect, but also bizarre this year. Summer very warm and very dry, it is raining a bit today as I write this, but they did not get much at all through the summer. There was some drought stress, but less than what could be expected, so the ripening went well. Diseases that plagued Southern France were all but absent in the North. Production is very big and of very good quality, not unlike in Champagne. I tasted some fermenting wines, they are very concentrated and rich, if the acidities hold up this could be a vintage like 1990 or 1982, the best in recent history. The 2017’s showed very well. Overall the wines are balanced, round and complete with the typical Chablis salinity, minerality and tension. They will age well, but can easily be drunk young. Chablis, fresh, round, more saline than mineral. Fevre Fevre 2017 Chablis “Fourchaume,” tighter, finer, more mineral. Fevre Fevre 2017 Chablis “Monts de Milieu” (1er Cru next to the Montée de Tonnerre), fuller, more concentration and acidity. Fevre Fevre 2017 Chablis “Vaulorent” (1er Cru next to Les Preuses), 15% wood, some new. Abundant fruit, young still, elegant. Fevre Fevre 2017 Chablis “Les Preuses,” this is in another league, 30% wood, some new. Young, tight, concentrated, crisp. Very good delivery here at every level. This vintage is clearly better and more typical than 2016, especially in Chablis and Fourchaume. However, I tasted prior vintages of Fourchaume and Preuses (2016), and both were outstanding. The following 2017’s are reserved for us – Chablis 3,000; Fourchaume 300, more possible; Monts de Milieu 120; Vaulorent 300; Preuses 2016 120. Vincent Dauvissat is a very kind, serious and soft spoken person, and runs the estate with his son Ghislain. We tasted 2017 vintages from barrel. Most wines are tank-fermented and than put in barrel, mostly older. Annually only a few new barrels are used for barrel fermentation. All wines receive their aging in small wood barrels. Everything is traditional here and I don’t have a clue what makes these wines so great. Yields are somewhat lower than average, but generally not really low. These wines are stunning, very pure and typical and true to their respective origins. They are sculpted thoroughbreds. Domaine Dauvissat Camus 2017 Chablis “Forets,” shy, fresh, typical. They all have the typical minerality, salinity and tension of Chablis, but very balanced by the fruit. 2017 is a vintage that will be lovely young. I think it will age well. I have rarely tasted a finer set of wines. Veronique, the office manager, will do the allocations in December, or so. No idea how much we will get, but they are very loyal. They have not taken on new customers for many years in order to maintain allocations for existing clients. 2018 Harvested 9/3 -9/17 under ideal conditions. They did not receive the two-day heat spike that Chablis got. They also had more rain during the growing season. Wines were too young to taste, but the winery smelled nice. Some hail damage, up to 20% in some areas, but this was pretty much compensated elsewhere. Domaine Guy & Yvan Dufouleur 2017 Aligoté, fresh, crisp, balanced, good acidity. Domaine Guy & Yvan Dufouleur 2017 Hautes Cotes de Nuits “16th Gen,” fuller, more spice, long. 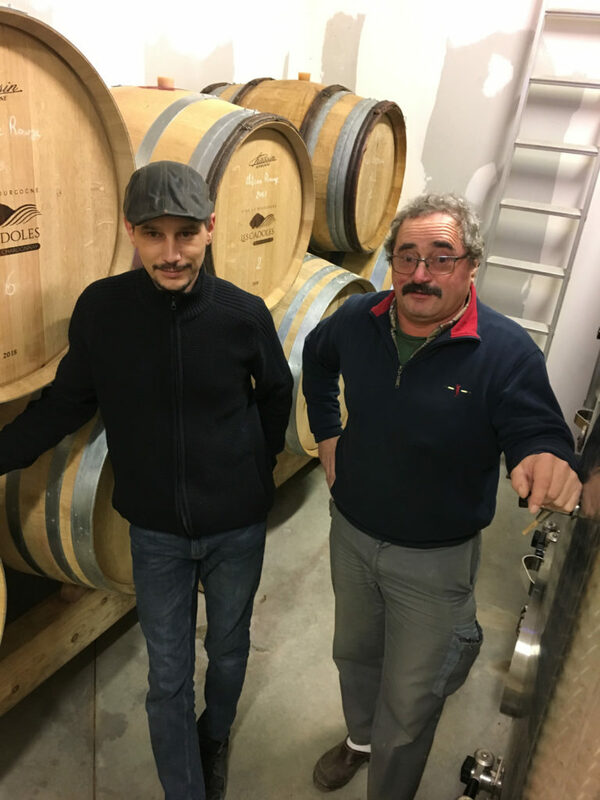 Domaine Guy & Yvan Dufouleur 2017 Hautes Cotes de Nuits “Huguettes,” sone new wood, classy. 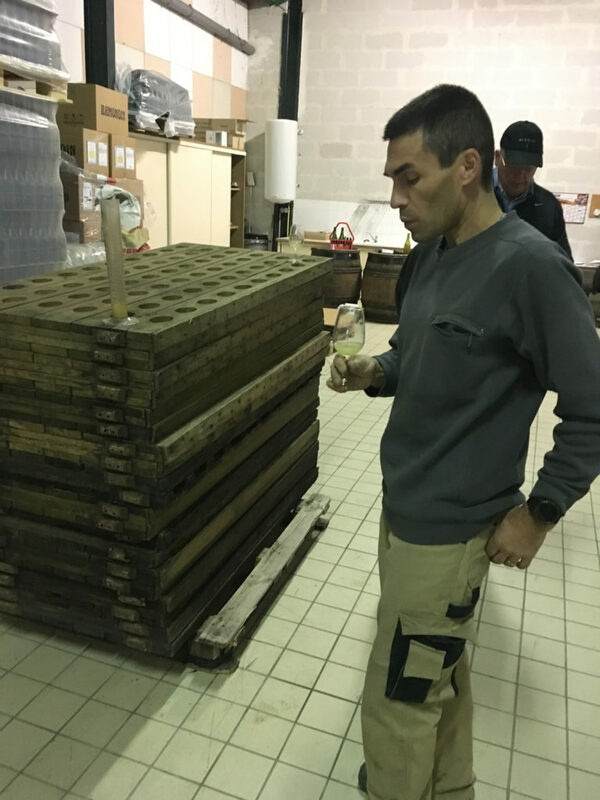 Domaine Guy & Yvan Dufouleur 2017 SLB, finer, fuller, more new wood. By October the above will all be bottled. Domaine Guy & Yvan Dufouleur 2017 Hautes Cotes de Nuits Rouge “16th Gen,” a little closed, good fruit. Domaine Guy & Yvan Dufouleur 2017 Hautes Cotes de Nuits Rouge “Hugettes,” more austere and tight. Domaine Guy & Yvan Dufouleur 2017 Santenay Genets, elegant, new wood , flavor. Domaine Guy & Yvan Dufouleur 2017 Volnay, lighter in color, finesse elegant, charm. Domaine Guy & Yvan Dufouleur 2017 Pommard, similar, more powerful. Domaine Guy & Yvan Dufouleur 2017 Nuits Saint Georges “Juliens,” light color, good fruit, structure. Domaine Guy & Yvan Dufouleur 2017 Fixin “Chapitre,” extremely dark for PN, all about power, fat and tannin, a monster. Domaine Guy & Yvan Dufouleur 2017 Nuits Saint Georges “Crots,” dark, fine. Domaine Guy & Yvan Dufouleur 2017 Nuits Saint Georges “Poulettes,” fine again, longer. Domaine Guy & Yvan Dufouleur 2017 Nuits Saint Georges “Perriere,” dark, powerful. Virtually all these reds were somewhat reductive, which is normal at this stage. They will get a last racking before bottling later this year. It makes tasting a little difficult, but I actually like it as it is a natural protection in the wine. 2017’s are rather soft and balanced and will be drinking beautifully young. Very consumer friendly wines, white as well as red. It’s all there in this vintage, but it’s not 2010 or 2015, more a slightly lighter edition of 2009. Dufouleur offers great value again! Very interesting visit, a lot happening here. Harvest situation similar to Dufouleur, obviously, as both have vineyards in the same areas. Very happy with his 2018’s although he worried a little bit about low acidities. This could be the hallmark of the vintage, but it’s too early to tell. Malic acid levels are low, so it will remain to be seen what’s left after the ML fermentation. They started in 2017 with 30% whole-cluster fermentation for some wines, in 2018 they have done this with most of the premium wines and with 30-50% whole bunch. From what I saw in some of the 2017’s this is a beneficial method for the domaine. Domaine R. Dubois & Fils 2017 Aligoté, rich an creamy, full and soft. Domaine R. Dubois & Fils 2017 Coteaux Bourguigonnes (chardonnay), more complexity and flavor. Domaine R. Dubois & Fils 2017 Hautes Cotes de Beaune Blanc very nice, some wood, a “little Meursault”. great value. Domaine R. Dubois & Fils 2017 Cotes de Nuits Villages Blanc, rich and fat, more wood, good balance. Domaine R. Dubois & Fils 2017 Nuits Saint Georges Blanc (new), even richer, ton of white fruit, very nice (it is actually from 1er Cru soil, but he finds the vines too young to call it that). The above are a great set of rich, soft, charming wines that will drink very well young and a little older. Domaine R. Dubois & Fils 2017 Bourgogne Rouge VV, quite stunning, good color, great Pinot fruit. Domaine R. Dubois & Fils 2017 Hautes Cotes de Nuits Rouge, less color, more austere, needs some time.Domaine R. Dubois & Fils 2017 Savigny lès Beaune Rouge, lighter color, good flavor and long. Domaine R. Dubois & Fils 2017 Beaune Rouge, good color, wood a bit dominant, needs time. Domaine R. Dubois & Fils 2017 Volnay, good color and fruit, finesse. Domaine R. Dubois & Fils 2017 Cotes de Nuits Villages Rouge, ample, fat, more masculin. Domaine R. Dubois & Fils 2017 Chambolle, very reductif, but seems very good. Domaine R. Dubois & Fils 2017 Nuits Saint Georges Rouge, full, powerful. 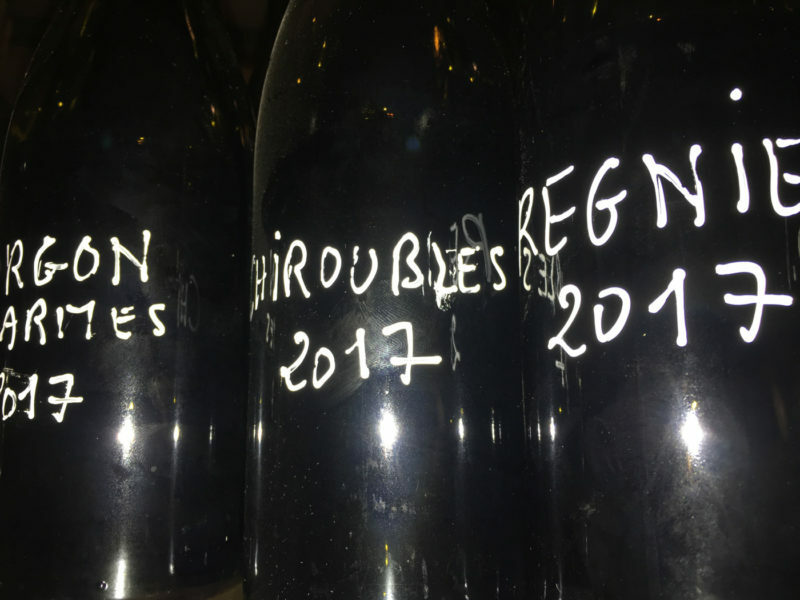 Domaine R. Dubois & Fils 2017 Savigny les Beaune Rouge “Narbantons,” concentration, sweet. Domaine R. Dubois & Fils 2017 Nuits Saint Georges Rouge “Argillières,” concentrated, sweet, soft. Eye opening visit with Proprietor Philippe Chautaurd. Founded in 1926 by the grandfather of Chautard. 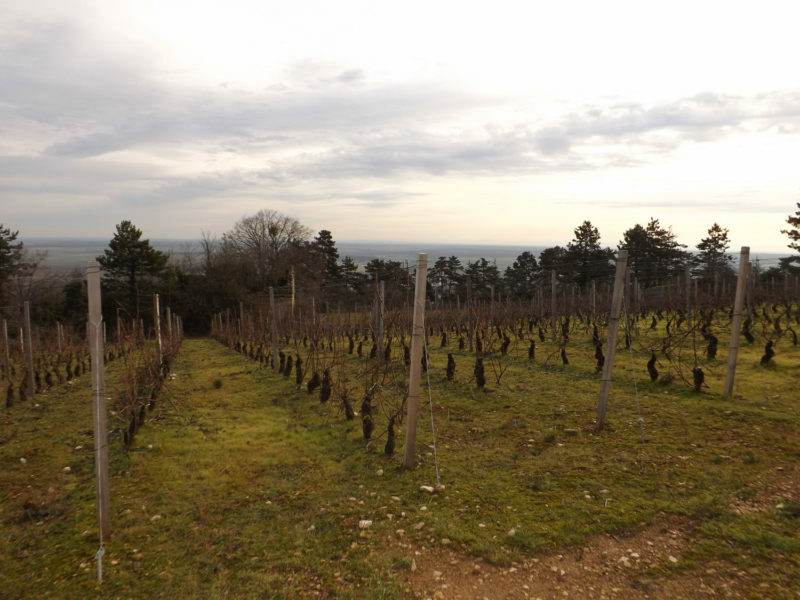 They have 40 acres all over Burgundy, but most wine/must is bought from contract growers. Capacity 400K bottles, in a brand new winery/cellar in Rully. These Cremants are made like Burgundy wine, with Burgundy varietals, from small plots, fully authentic, consequently all vintage-dated. To me this is absolutely unique, I don’t think there’s any other producer like it. “Crémant de Terroir”, if you will, a great sales pitch for Sommeliers to make on the floor to tables! All wines are made by Champagne Method, very much like Champagne, bottled in March, long bottle ageing, at least 18 months. Dosage is low, mostly 6.75 or lower. All rather dry, fresh and crisp. Picamelot 2014 Cremant de Bourgogne “Terroir” (which we carry), 40 Chard / 30 Pinot / 30 Aligote, dry, fresh, young. Very good indeed. Picamelot 2015 Cremant de Bourgogne Rosé, 100% PN, aromatic, dry, noble. Picamelot 2014 Cremant de Bourgogne “Bio,” 100% PN, aromatic again, dry, ripe. Picamelot 2014 Cremant de Bourgogne “Blanc de Blancs,” Chardonnay/Aligote, a lot of flavor, long. Picamelot 2014 Cremant de Bourgogne “Blanc de Blancs Reipes,” 100% Chardonnay from Saint Aubin, austere, fine, top. Picamelot 2013 Cremant de Bourgogne (unnamed barrel aged cuvee), Chard/Aligote, a little ripe for me. Back labels (EU) are very elaborate, they state vintage, bottling date, blend, disgorgment date, dosage. We should expand our Picamelot offerings, if you agree let us know or just post a comment! That is it for now – The next time around I’ll figure out the whole Android photo upload thing and integrate some photo material.